OK, so the powers-the-be figured out that following up Star Wars with the Star Wars Holiday Special was NOT a good idea. But what about a record album for the holiday? 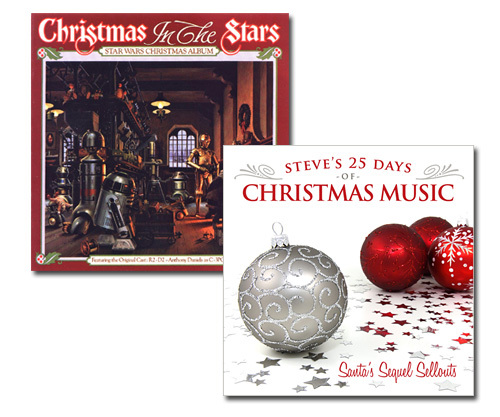 Enter Christmas in the Stars: Star Wars Christmas Album. 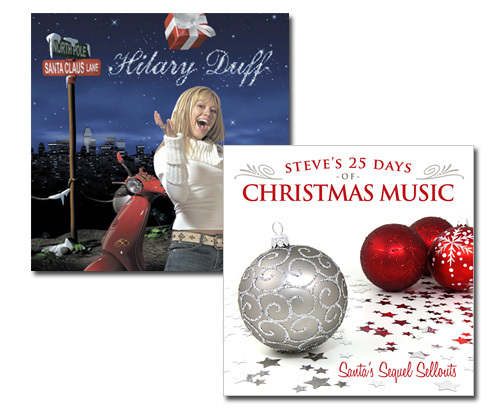 Originally concepted to be a whole series of Christmas albums based on the franchise, it ended up being the only one. 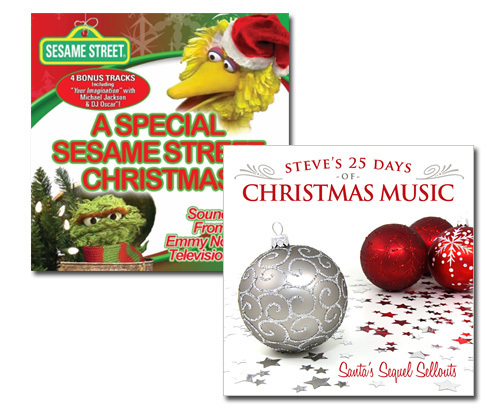 A Special Sesame Street Christmas has the distinction of being a Christmas TV special that sequeled its sibling show just 5 days after airing. Eartha Kitt's "Santa Baby" was a big hit in 1953 (we featured it in the 2002 edition of Steve's 25 Days). Not willing to leave well-enough alone, she performed a sequel song one year later, This Year's Santa Baby. It didn't do so well, as you probably could have guessed. 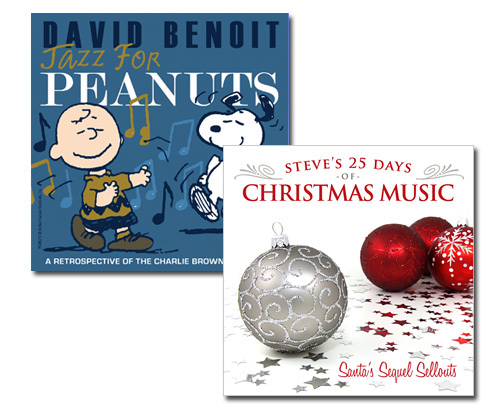 Last week I negatively reviewed the first sequel to A Charlie Brown Christmas, which featured a poor cover version of "Linus & Lucy" by David Benoit. Believe it or not, there were actually two other Charlie Brown sequels to follow that failed attempt. Licking their wounds from the Christmastime disaster, a new mini-special appeared 10 years later in 2002. By this time, ABC had won the broadcast rights to the Peanuts specials away from CBS (which had shown the special for 35 years). This move was heralded as a big deal. To show that things were different (but better), ABC commissioned a new, shorter special called Charlie Brown's Christmas Tales. You see, in recent years CBS had been editing down the original episode to run more commercials in the 30-minute timeslot. ABC wanted to run the special unedited, but that would have created an odd time length in today's commercial climate, surpassing the 30-minute mark. To solve this problem, Christmas Tales was created to fill out the rest of the time, creating an hour-long block. A Christmas Story saw a direct-to-video sequel nobody asked for show up on shelves this year. Back in 2003, it was National Lampoon's Christmas Vacation's turn to be sullied. I'm talking about National Lampoon's Christmas Vacation 2: Cousin Eddie's Island Adventure. 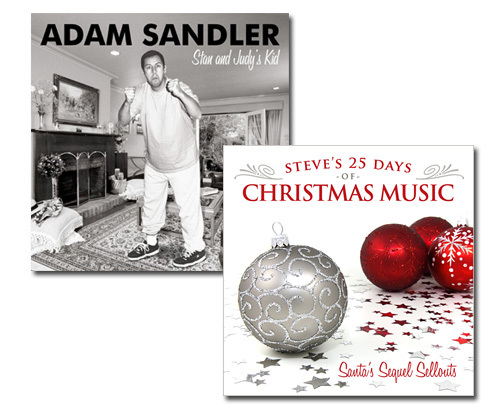 With a theme like "Santa's Sequel Sellouts," you just knew I was going to revisit The Chanukah Song by Adam Sandler, right? As noted when we talked about Neil Diamond's cover of the original, the first song debuted in 1995 (and was featured on the 2002 edition of Steve's 25 Days). After the success of Tim Allen's The Santa Clause in 1994, Disney pushed a sequel into production with a broader marketing approach. The Santa Clause 2 debuted in 2002 not only with an abundance of really bad CGI, but also a theme song provided by Disney Channel superstar Hillary Duff. Santa Claus Lane was hyped considerably across the Disney empire to help promote the film. The movie itself was not exactly critically loved, but it did well enough commercial to spawn another sequel 4 years later. (Translation: Tim Allen's career was pretty much supported solely by the Mouse for a decade or so). As I previously mentioned, the 1970s were prime for Christmas sequels for some reason. Here we have another example of the third type of Christmas sequel, "Non-Christmas Songs/Shows/Movies that are sequels to Christmas Songs/Shows/Movies." In this case, it was a Halloween-themed follow up called Halloween in Grinch Night, which apparently also served as a prequel in 1977 (long pre-dating the combination of Halloween/Christmas in The Nightmare Before Christmas). 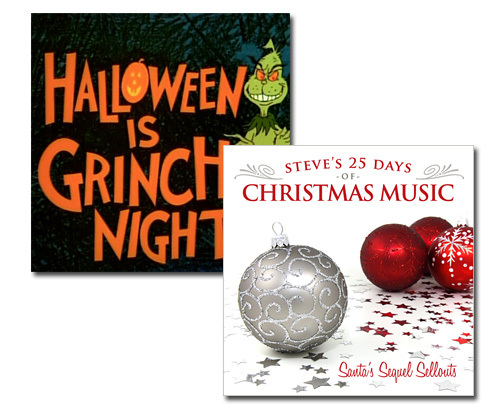 In later showings, the Halloween name was dropped and when it was released on video, the show became It's Grinch Night. The original Rankin/Bass stop-motion animated classic Rudolph the Red-Nosed Reindeer has received at least two notable sequels over the years. Today we feature music from the first, 1976's Rudolph's Shiny New Year. The song is Have A Hap-Hap-Happy New Year, performed by Red Skelton. As you can probably guess, the theme of this special shifts to the celebration of New Year's Day. The plot involves something about the Baby New Year having gone missing, and Santa enlisting Rudolph to find him, otherwise time will be stuck on December 31 year over and over. We're all pretty familiar with the 1965 television classic, A Charlie Brown Christmas. But did you know that there are 3 sequels to this iconic show? Today's song is pulled from the first attempted sequel, appearing 27 years after the original. It's Christmastime Again, Charlie Brown hit the airwaves on CBS in 1992. Interestingly, this was actually released to video first, via an exclusive at Shell gas stations.